to substitute an image of the Virgin Mary. Here are the Before and After images. Scroll down to see how I made the change. 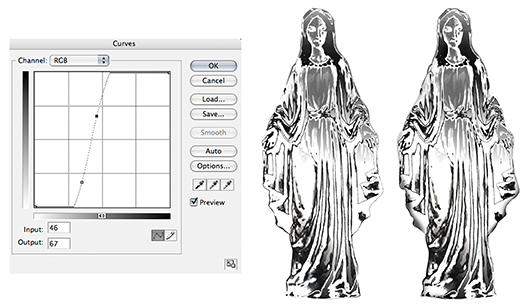 I began with a color photo of a statue of the Virgin Mary. I clipped it out with Photoshop’s Pen tool, desaturated the image, then applied a white to black gradient at low opacity from top to bottom, to give the image some extra contrast. Photoshop does have a Sketch>Chrome filter, but I found it next to useless. I used the Curves adjustment tool instead. There’s no “right answer” in this case. One has to experiment with configurations that resemble the one shown below. I used the Burn tool around the edges to add a bit more contrast. You can see how the main folds are a bit darker in the image on the right below. 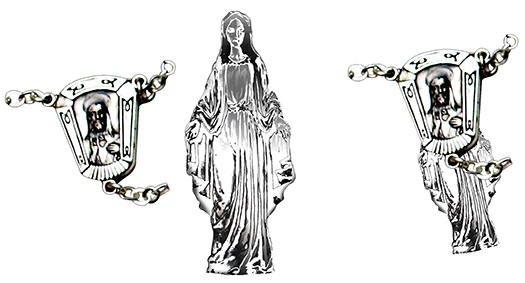 Next I copied and pasted the chromed image into the rosary centerpiece image, placing it on a separate layer beneath the centerpiece. Then I scaled it down and rotated it into position. I applied a Layer Mask to the top image, then selected the innermost image area of the centerpiece. 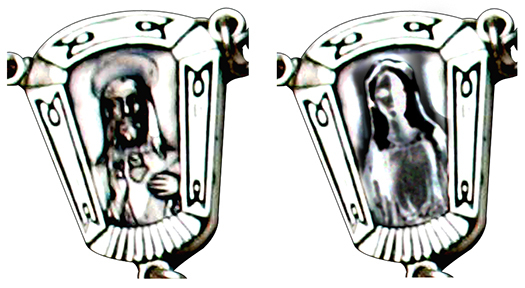 Using color Black and a soft airbrush at low opacity, I brushed away the selected portion of the mask to reveal the Mary image underneath. 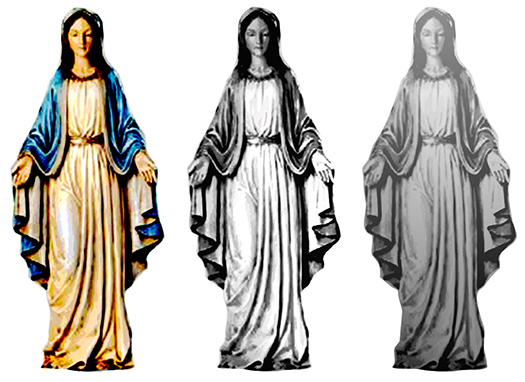 Final steps: I applied a 2-pixel Gaussian Blur to the Mary image, used the Burn tool to darken it a bit, applied the Texture>Grain filter, Type = Contrasty, and used a soft brush at reduced opacity to add a few spot touches of blue and green. ← king’s spEch wins bst pic Oscar txt it on! 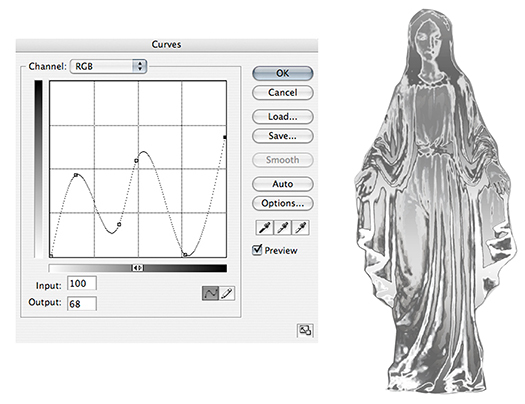 Very cool I would have never though of using the curve to get the effect you did. Ill keep that in mind next time I’m working on something like this. I have so much to learn but your instructions are excellent. I have now bought a tutorial on photoshop so with that and your excercises I may eventually achieve something! Many thanks. Nice tutorial, Mark. I just wrote a post on The Magic of Photoshop earlier this week with examples of some of the creative things you can do with Photoshop. Take a peek if you get a chance. Love that I have a new source of knowledge to learn from when I come here! Thanks for sharing. I like seeing the process of making the change. I’ve often seen a finished piece myself and wondered how the heck it was done… : ( Happy to give you a peek behind the scenes, and glad you found it helpful. Thanks for stopping by!